Back in the summer of 2012 I reviewed the new 15″ Retina MacBook Pro. It was an upgrade from my previous MacBook that had been modified to take a 1TB hard drive as well as an SSD, so while the move to an even faster SSD was great, I had to use an external USB hard drive to deal with the lack of space. “Perhaps in two years time there might even be a 1TB SSD that won’t be the price of a small family hatchback!?“. 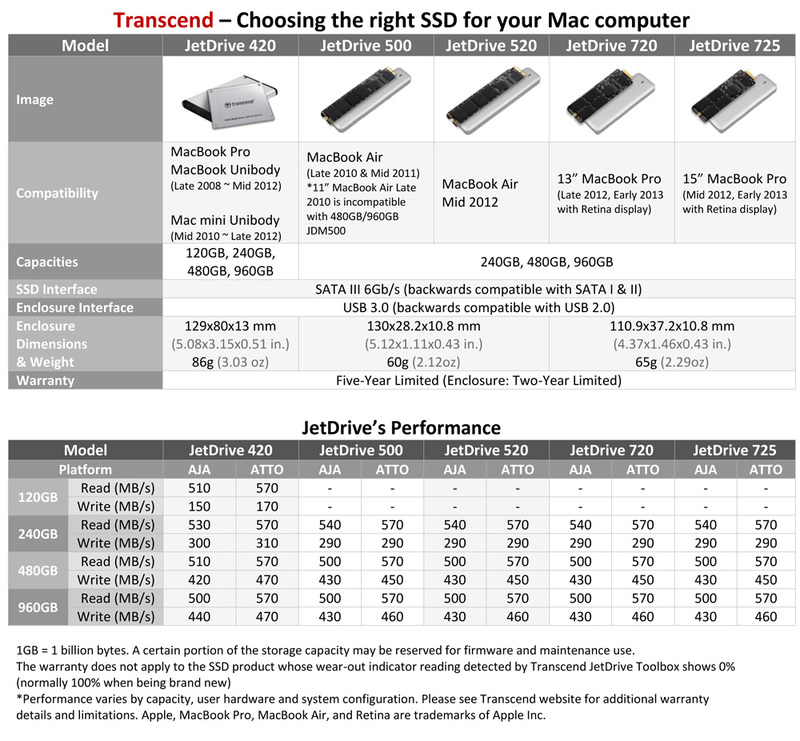 Well, two years have passed and now the new Transcend JetDrive range of replacement SSDs are available for the MacBook Pro and McBook Air. In a range of models (including the 420, 500 and 520), it was the 720 that was originally intended for my mid 2012 machine. But shortly after release some MacBooks where found to have very slightly different internals so Transcend set about re-designing a shorter board and the 725 was born. Available in 240GB, 480GB and 960GB versions, the JetDrive kit includes the SSD itself, a metal USB 3.0 to SATA enclosure, screwdrivers (T5 & P5), USB cable and travel pouch. The enclosure allows you to clone your existing drive to new the new SSD. You then swap them around putting the bigger SSD in your MacBook and your old board in the enclosure (giving you a useful, fast external drive). There’s an excellent video of the installation (below) to guide you through the upgrade process. You boot your Mac to the recovery partition (note: hold down ‘cmd R’ not the ‘Option’ key as it says in the video) and restore your existing drive onto the new one (which took around 15 minutes). The task of opening the MacBook, disconnecting the battery and swapping the boards is very simple and only took around 10 minutes. After the installation you download and install the JetDrive ToolBox to enable Trim. As well as almost quadrupling the 256GB SSD there’s also a slight performance gain too. 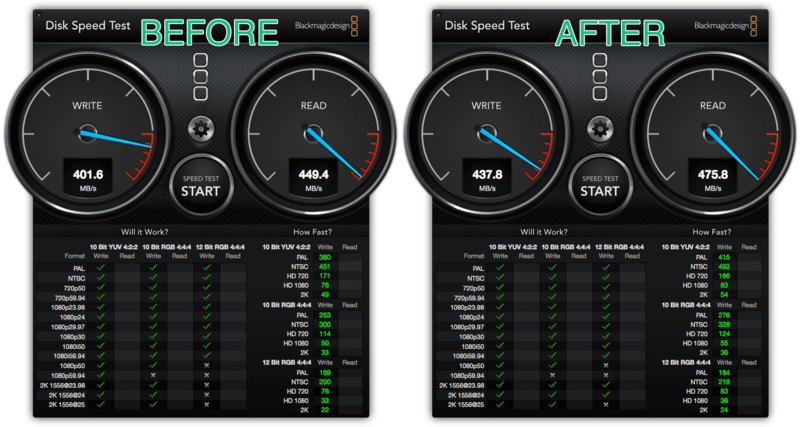 Below are the before and after speed tests using the Blackmagic app. Prices for the 725 SSD (check the correct model for your MacBook from the table above) are currently around £125 for the 240GB, £235 for the 480GB and £430 for the 960GB. Upgrading from the stock 256GB SSD to a 1TB at time of purchase will costs you £640 so theses prices represent a significant saving over the Apple boards. There’s a 5 year warranty on the SSD (2 years on the enclosure) providing peace of mind too. 3 Comments on "Review: Transcend JetDrive 725 Upgrades Our Retina MacBook SSD to 960GB"
Please advice if this one works with MBP Retina late 2013 models too. Thanks. I’m looking to upgrade my MBPr’s SSD as well and I was wondering what it did to battery life? I’ve read that the OWC SSD wears down the battery quicker than the factory. Not noticed any change in battery life.